July 16, 2017. Early morning. A picture perfect day for walking the beach. I feel so lucky to have found so many little treasures on the beach. For several years now, I have been walking the beach to look for sand dollars. I also, pick up beach trash as I go. My good deed. 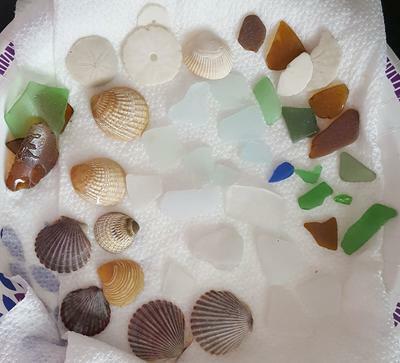 Last year I found maybe 5 pieces of sea glass all summer. This year, I find some every weekend. I'm still picking up beach trash as I go. Maybe the sea glass is my reward for picking up the trash! Sometimes the best photographs are the simplest! For this photo for Sea Glass Photo of the Month! Register your votes by clicking the comment link below. Enter your name (optional), a title, and a brief comment (like My Vote). A comment counts as one vote. Share this with your friends so they can vote too. See buttons at the bottom of this page.